The snow is slowly disappearing but the frost is well into the ground and it is still rock hard underneath. Two pics from last weekend show Alan my neighbouring farmer (!!!???) 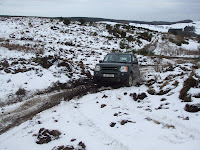 and Stewart who works for Mike Aitken 4x4 at the start of the day. 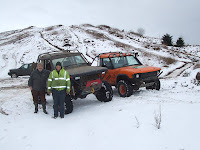 Yes Alan really does use his Disco off road!! I have just sent a new email around our Club Members (if anyone didn't get it just email me!) re the combination and some unwelcome visitors.